Renovate to Sell that House – Bathrooms Part One! So we are into our New Year – ready to take on 2012 with renewed enthusiasm and perhaps thinking of selling that house. This month we discuss the bathroom. 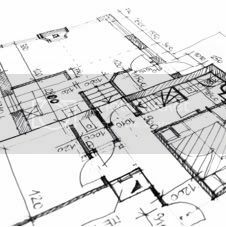 In square footage usually the smallest of the rooms in the house, but one of the most important along with the kitchen and the one that could clinch that deal. So we are into our New Year – ready to take on 2012 with renewed enthusiasm and perhaps thinking of selling that house. This month we discuss the bathroom. In square footage usually the smallest of the rooms in the house, but one of the most important along with the kitchen and the one that could clinch that deal. Picture above courtesy Laufen UK. Last month we discussed kitchen in our two-part series for the do’s and don’ts page as well as part two for tips and ideas on flooring, lighting and more. So let’s start with the planning stage…. 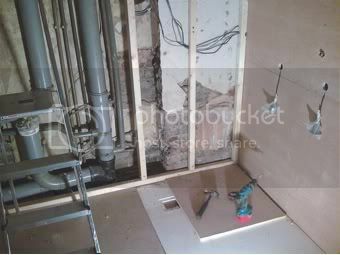 People always forget where and how far the pipes are, where the waste/soil pipes are and where the boiler is etc… plumbing is the most critical factor in re-designing/refurbishing a bathroom. This information will dictate what kind of shower pressure you can have and how far you can move the loo or sink or not! It’s pointless actually choosing anything until you have that information. I wouldn’t advise to deal with the heating and plumbing yourself – make sure you organise these trades well in advance as they are always busy, consult Sarah Beeny’s trade service directory on this website right here. You can then discuss all the point below with them. Take out the old sink, loo and bath BEFORE you have received the new ones! Sounds logical but people do it…. If you can recycle your bath/shower, sink and loo then these big ticket items will go a long way towards a smaller budget expenditure. If not then ensure you do offer them on Freecycle or call your local Houseold Recycling Centre (just put your postcode in) to see if they take them (these will be crushed and re-cycled to make other materials and saves on landfill space). Same goes with tiles- usually when you take old tiles off, the grout is persistent and it is difficult to clean them up but if you manage to take them off cleanly then again offer them on Freecycle or the local waste recycling centre or if they are vintage or older ones then why not sell them on Salvoweb? So discuss with your contractor what type of existing boiler you have – this will dictate up to a point what kind of fixtures you can have, he will also look at the pressure of the water coming in. Low pressure tank systems usually work at 0.5 or lower and high pressure system at 2.0 and higher. Mains water can vary – a lot! It can be anything from 1 Bar to 7 bar of pressure. The water flow (the rate at which the water comes out of your taps) can be slower – if the pipes are clogged or thin – this is different to the pressure. Your contractor will also discuss what kind of heating you can have – consider that you can have a towel heater that doubles up as a radiator. This saves space. Once you are happy with the explanations given, then your contractor can advise on what you will need as a minimum for your shower head, taps and toilet (for the toilet is the pipe is floor or wall inserted, bear this in mind when shopping for the toilet style). Armed with all the info you can ask the contractors that will do the work : electrician, tiler, bathroom installer, etc… to give you some quotes. This will give you a guide on what you can expect to pay for the items you want to change. It is then easier to trim down on what you do not really need and what the essentials are. I always find that this gives you an idea of what things cost, and you can decide if you afford it. I also think that as the deciding factor for the type of functions you can have and not have for your bathroom is your existing plumbing and heating, you will not then be surprised by unexpected bills. The average person uses around 150litres of water per day and a third of this is from the use of toilets. Bearing in mind that in the UK we use “clean” water to flush, this uses a very precious resource. Showers are in general more cost effective and less resource hungry than baths – a five minute shower uses a third less water than a bath, but a power show can use more water in five minutes than a bath! But there are things you can do to mitigate this waste – notwithstanding that it will help your wallet too – especially if you are on a water metre. Ensure you have flow emitters fitted to your shower heads and taps. Discuss this with the contractor but you can buy for around £5.00. Nifty things these and available at any plumbing or DIY store. But you can also buy water saving taps from most manufacturers. Choose a dual flush toilet cistern – a standard loo uses 9 litres of water per minute to flush! Excessive and needless whilst a dual flush will use 2.5 litres per minute of water. All light fitting should be fitted with a pull cord and you want a light switch then t has to be situated outside the bathroom. Similarly any electric power isolating switch or ventilation fan switch should be situated outside the bathroom – I usually have them fitted on the side of the door frame at the bottom so as to appear less noticeable as they are not pretty! Picture above courtesy Laufen UK. No sockets are allowed in the bathroom with the exception of an electric shaver point – but you need to plan ahead before plastering (again) or tiling so that this can be chased into the wall. 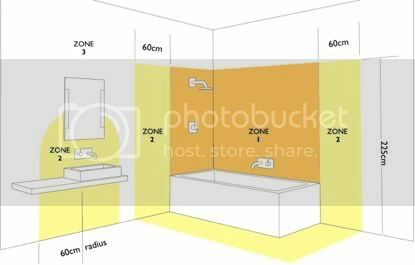 The bathroom is divided into “electrical” zones. Zones 0 to 2 are the wettest areas and any electrical object must not have a higher voltage of 12V with an IPX7 (Ingress Protection (mechanical and moisture protection) against factors such as condensation, humidity, steam, drops of water or sprays from showers). So as you can see from the diagram the zones dictate what kind of electrical fittings you can have. We will go into this in more detail next week as it forms part of the decorative elements to your bathroom re-design too. Meanwhile start planning!